We stayed in the apartment on Chebnicka Street. It is one street away from Dlugi Targ and at the back of Dwor Artusa - so very close to the main tourist sites. As it has a separate bedroom and a kitchen/sitting room, it seemed quite large - good for staying several nights. Beds were good and had summer duvets and the bedroom had dark curtains to cut out the light. Kitchen equipment all worked well and there was a slimline washing machine. Wifi worked OK. Host met us at the time we requested. Excellent location. Very good details on key collection. Super. Location excellent. We would like to take advantage of this apartment later if possible. central location , comfy bed ,clean and warm apartment and English news channels . Perfect location! Very nice and spacious apartment. Balcony was the only thing we were missing. Location was excellent, in the centre of the Old Town. Amazing location, in the middle of old town, also 8 min to main train station and big super market. The apartment is large and really in the center of the town. The owner came to show the flat in the late evening and help us to bring the luggage in. He was helpfull and kind. Lock in a great price for RentApart Centrum – rated 9 by recent guests! One of our top picks in Gdańsk.RentApart Centrum is a self-catering accommodations located in central Gdańsk, 900 feet from the Crane over the Motława River. Guests are welcome to use free WiFi. The apartment will provide you with a flat-screen cable TV and a furnished balcony overlooking a green area. There is a full kitchen with a microwave and a refrigerator. Featuring a shower, private bathroom also comes with a hairdryer. Guests at RentApart Centrum will walk in 7 minutes to such landmarks in the Gdańsk Old Town as Artus Court. The distance to Gdańsk Airport is 11 mi and the property offers airport shuttle at a surcharge. When would you like to stay at RentApart Centrum? This apartment has a sofa, microwave and kitchen. This apartment has a private entrance, electric kettle and toaster. Mieszkania w kamienicach na Starówce. Serce Starego Miasta. Zabytki Starego Miasta na wyciągnięcie ręki.Restauracje ,puby, kawiarnie -wszystko tuż za rogiem. House Rules RentApart Centrum takes special requests – add in the next step! RentApart Centrum accepts these cards and reserves the right to temporarily hold an amount prior to arrival. Please inform RentApart Centrum of your expected arrival time in advance. You can use the Special Requests box when booking, or contact the property directly using the contact details in your confirmation. no late check out or left luggage facilities . The water turned cold after the first shower so that the second one to go to shower had to do it with cold water which was not nice at all. Even though the water heater looked like it had some warm water left there still wasn't any. It wasn’t very confortable. The things in the kitchen were not very clean, few cutlery, only beer or vodka glasses. But the worste thing was the bathroom: no shelves, no shower courtains and a broken faucet. Every time we need to dry the floor. Noisy surroundings - one night 'twas drunken crowd under window, another two nights - russian girl who yelled with badwords to someone. And sound of food delivery for local restaurants in mornings. And squeaky bed. Also it was a headache to find the place - it is placed at the back yard of building. Cozy, comfortable, in the middle of old city heart. 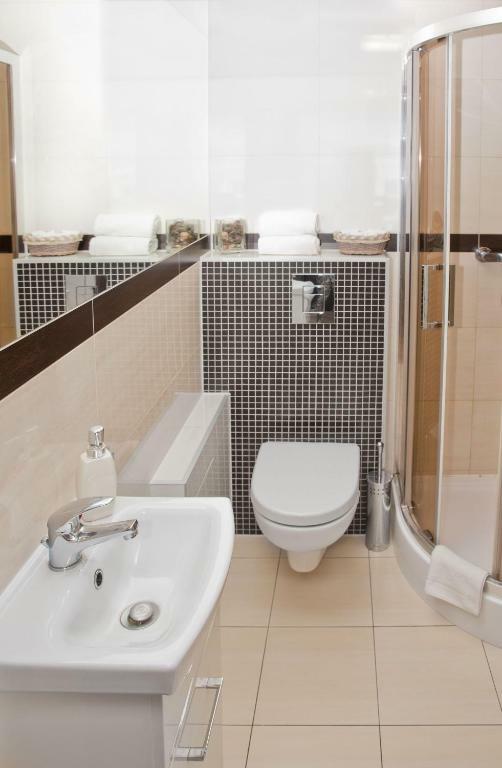 Everything you may need in apartments - even tea, coffee and sugar :) Very comfortable bathroom. Big TV (havn't watch it, don't know). Nice place to have a rest between whole-day city raids. In the city center, location is perfect. Very clean, you can have all you need. Great apartment, clean, fully equipped, everything is new and well kept, amazing location, good for families up to 6 people, but also for romantic couple. There's a kitchen with all the facilities, two bedrooms and a living room with a sofa and a TV. No air conditioning, but I don't know if you need it at all in Poland, we didn't need it. There's a very nice restaurant (Canin) just next door. In general, everything is really close by. Easy access from the airport by bus number 210. Very comfortable apartment, everything was spotless clean and we just loved the location!